Welcome to the Finding Sydney website, created by HMAS Sydney Search Pty Ltd (Sydney Search) as Trustee for the Finding Sydney Foundation and maintained by the Naval Association of Australia. The Finding Sydney Foundation was formed to find the Royal Australian Navy light cruiser HMAS Sydney (II), lost in action with all hands during November 1941. 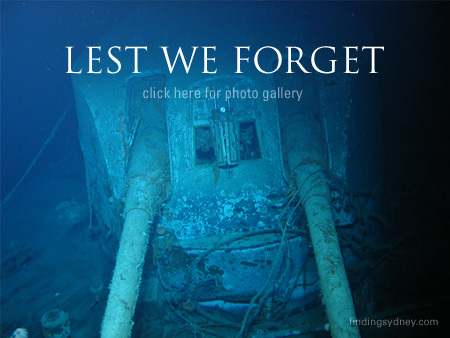 Sydney Search found the wreckage of HMAS Sydney on the 16th March 2008, allowing closure to the families of those lost. The foundation plans to further commemorate the missing crew. The Directors of the Foundation are unpaid volunteers. A DVD slideshow of photographs of the wrecks of HMAS Sydney II and HSK Kormoran is being made available to the families of the men lost in November 1941 and shipmates who served in the ship prior to her tragic wartime sinking. Click here for further information, Request Form here in PDF format (free Reader). The wreck of missing Royal Australian Navy light cruiser HMAS Sydney (II) has been found. Read the Media Release and Search Diary Entry from the Finding Sydney Foundation.